In the old days, people consulted an actual human person to get recommendations on where to stay, work and network in an unfamiliar town. 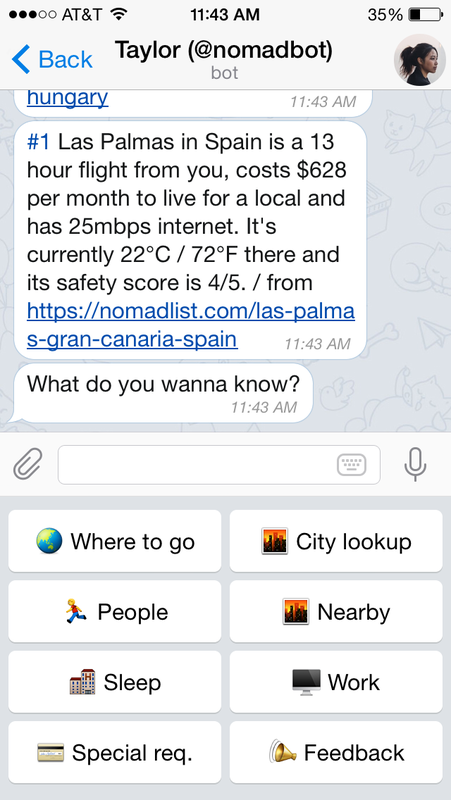 But it’s the modern era and Taylor, a chatbot on Telegram geared specifically for recommendations in certain metro areas, does her robotic best to help you find the next foreign country to live and work. Debuting on Product Hunt on July 4, Taylor seems a little more like a proof of concept than a fully fleshed-out product, especially since developer Pieter Levels created it within a week using Telegram’s newly-released Bot API. It runs on a small backbone of data gathered by NomadList, a handy chart designed to catalogue the top places to work remotely across the globe. That list, in turn, is a part of the larger #Nomad movement, a thousands-strong Slack channel about globalization, startups and journeymen entrepreneurs that’s really trying to become a thing. In addition to a limited data pool, Taylor hardly passes any loose application of the Turing test. She works best with the few emoji-laced options that come in a pre-set keyboard, which include options like “Work” and “Sleep,” but Levels has promised to amplify her abilities over time. Within my native San Francisco, Taylor gives me a few brief options when I press either button, suggesting a list of hostels to stay in or coffee shops with free Wi-Fi. It also gives a list of #Nomad folks who live in the city, whom you could theoretically tweet at for a round of beers. Telegram’s focus on privacy (and excluding automatic location tracking) means that Taylor is less nuanced with her suggestions, providing locations that are closer to downtown proper than my middle-of-nowhere house that lies in a wasteland between two BART stations. But if I were one of these traveling developers that Taylor is designed to cater to, the utilitarian listicles she offers would help me decide easily where to park my gear. More specific questions live under a “special request” form and cost $25 to answer. Taylor also offers “Nearby” and “City Lookup,” which provide quick hits about other cities that fall within the NomadList. Ping either of these and Taylor will give a quick snapshot of how far the city is away from your current location, how much it costs to live there, how warm or safe it is and, perhaps most importantly, whether there’s a decent Internet connection. The feature is fun, suggesting a trip to everywhere from Reno, Nevada to Hoi An, Vietnam, on practically any budget. It’s a cute little tool that will likely help fuel the dreams of techies who imagine working from cafes across the world. Hey, I can dream, right?